Disney Springs is a great place to take a break from the theme parks, whether it's for the day or just the afternoon. Guests will find a wide selection of dining establishments available, with something for everyone, from kid-friendly to upscale. Several restaurants have waterfront views and many offer live music. Draft beer and fountain sodas are also served here. Waterfront margarita bar, themed like a Florida fruit stand from the 1960's and serving handcrafted margaritas, cocktails and authentic Florida brews. Live performers from 2:30-10:30 p.m. on Sunday-Thursday and 12:30-10:30 p.m. on Fridays and Saturdays. Serving breakfast, lunch and dinner. Freshly prepared sandwiches with specialty sauces and spreads. Salads, wraps, yogurts, fruit in a pre-made "Grab 'n Go" selection. Also offering a selection of turnovers, scones, cookies, brownies and ice cream sandwiches. Beverage offerings include beer, soft drinks, smoothies, juice, tea and their trademark Earl's Grey Lemonade. Counter service with inside seating. Often busy, but another Marketplace "gem" for a reasonably priced meal. There's a selection of merchandise for sale. Get your coffee fix with fresh brewed coffee products by Joffrey's Coffee. Frozen drinks, tea, and cocoa are also available. Tropical smoothies of all kinds are available at this Joffrey's location. Adults can also enjoy a selection of alcoholic beverages—including coffee with Bailey’s, Kahlúa, and Jameson. This walk-up kiosk is open 8:00 a.m. - midnight in front of World of Disney. Starbucks beverages and baked goods are available. 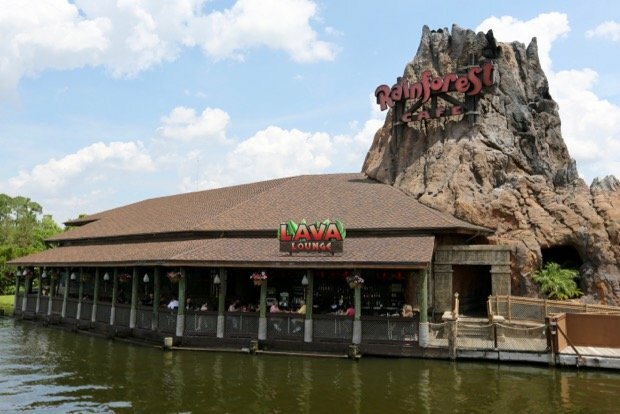 If you like Rainforest Cafe, then you will probably love this place. It's loud, and if you're looking for a nice dinner where you can talk to the people you are with, this might not be the place. This restaurant operates 11 a.m. - 11 p.m. Sunday through Thursday and 11 a.m. - Midnight Friday - Saturday. T-Rex has a Build-A-Dino Workshop by Build-A-Bear. 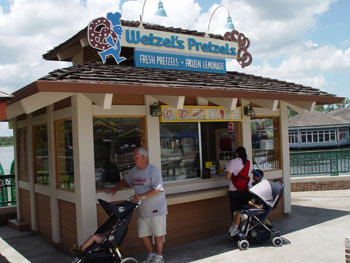 Walk-up kiosk serving freshly baked flavored pretzels, hot dogs, cheese dogs, frozen lemonade, granitas, and soft drinks. Enjoy dinner while taking in a film. 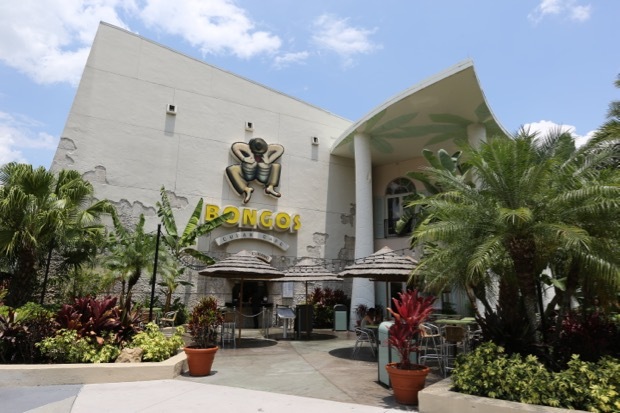 Co-owned by legendary singer Gloria Estefan, Bongo's offers a taste of authentic Cuban cuisine in a wonderful atmosphere. 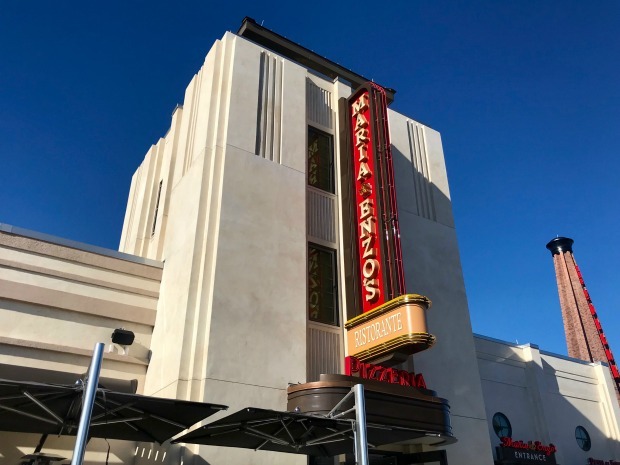 This new quick-service restaurant is the creation of celebrity chef Guy Fieri and restauranteur Robert Earl and is next to Planet Hollywood on Disney Springs' West Side. Take a look at the full menu by clicking the link above. 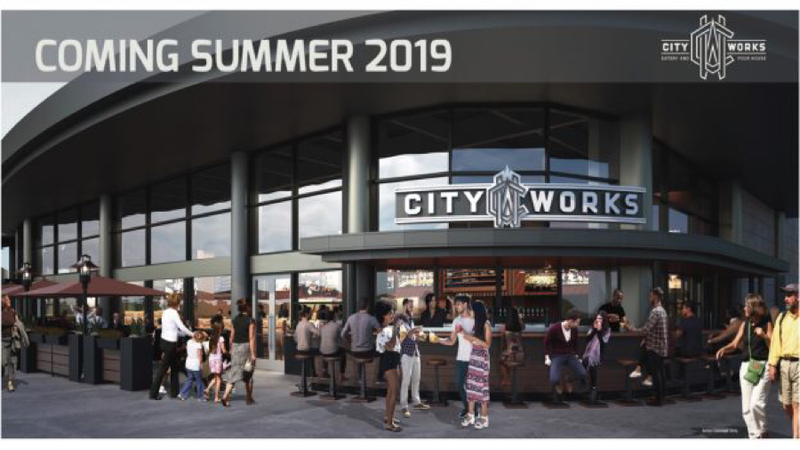 City Works Eatery & Pour House - Opening in 2019! This new dining establishment will offer lots of high-def TVs including a 165-inch screen that will be perfect for viewing live sporting events. There will be 80 beers on tap including rare, limited supply, special offerings from local breweries and others from around the world. 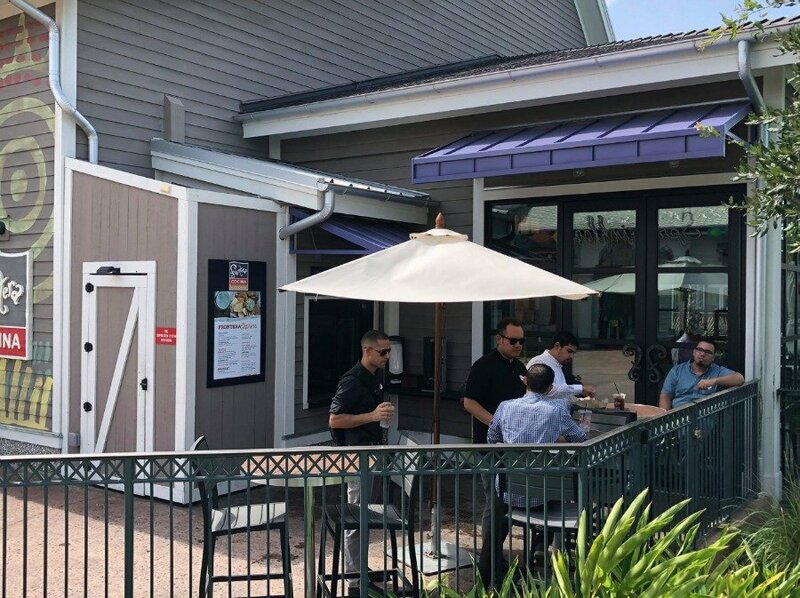 A curated selection of popular wines will be available in addition to bar bites, shareable meals, burgers, and more. 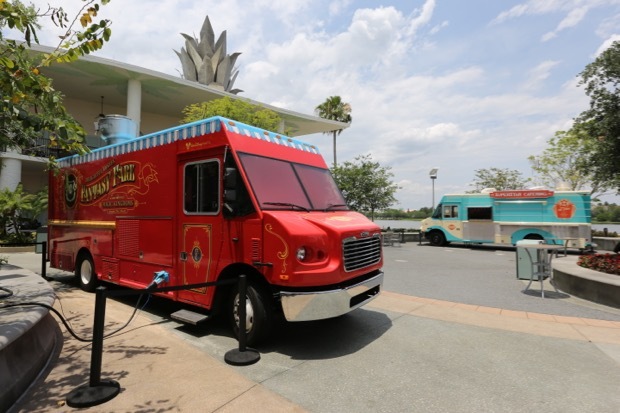 This is the permanent location for food trucks at Disney Springs. Disney owns four and one or more will always be found here. Local trucks may also be here from time to time. The area is located between Bongo's Cuban Cafe and Starbucks. Guests can take their pick from an assortment of flavors that can be made into frosty treats such as sundaes and shakes. The table-service menu boasts a wide variety of American and international foods. The Gospel Brunch held here on Sundays, Wednesdays and Fridays is NOT to be missed. Outdoor stage area offering cocktails and live entertainment nightly. This is a quick-service BBQ restaurant. 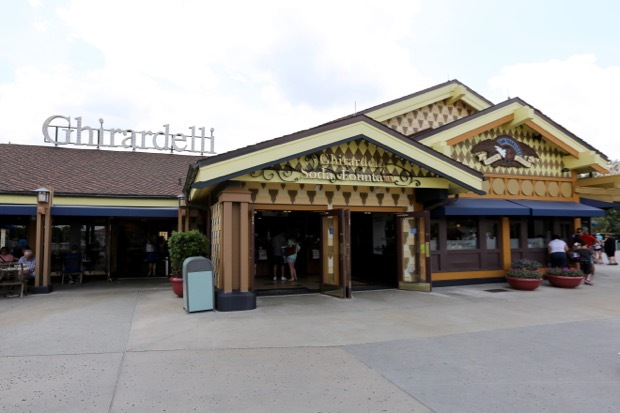 Guests can order their food at a walk-up window and seating is available in the outdoor patio area shared with the main restaurant. Live music is featured on the venue's stage, so the patio is the perfect place to enjoy the entertainment. 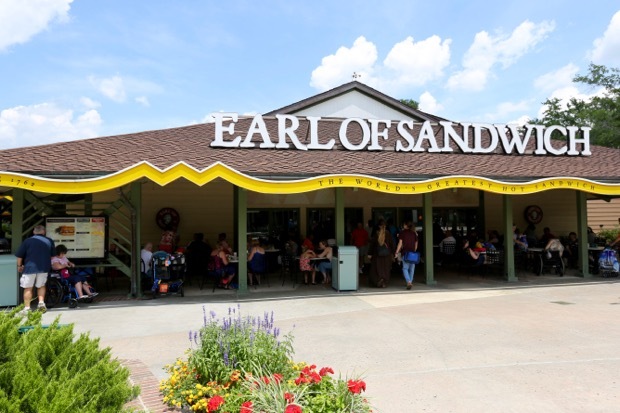 Menu items include Pulled Pork or Chicken Sandwiches, Smoked Turkey Legs, Smoked Beef Brisket Sandwiches, St. Louis Ribs, Hot Dogs, Cole Slaw, Baked Beans, Chips, and Desserts. Beer, Wine, Cocktails, and soft drinks are also available. Jaleo by Chef José Andrés Now Open! Jaleo brings alive the spirit and flavors of Spain by showcasing the rich regional diversity of Spanish cuisine. Celebrating the traditional as well as the cutting-edge, Jaleo offers a taste of Spain in a festive, stylish, and casual atmosphere. Get a cool boost at this West Side kiosk featuring gourmet, tropical smoothies in 8 unique flavors. Alcoholic beverages, coffee, hot chocolate and tea are also available. Pepe is now open serving lunch and dinner daily. 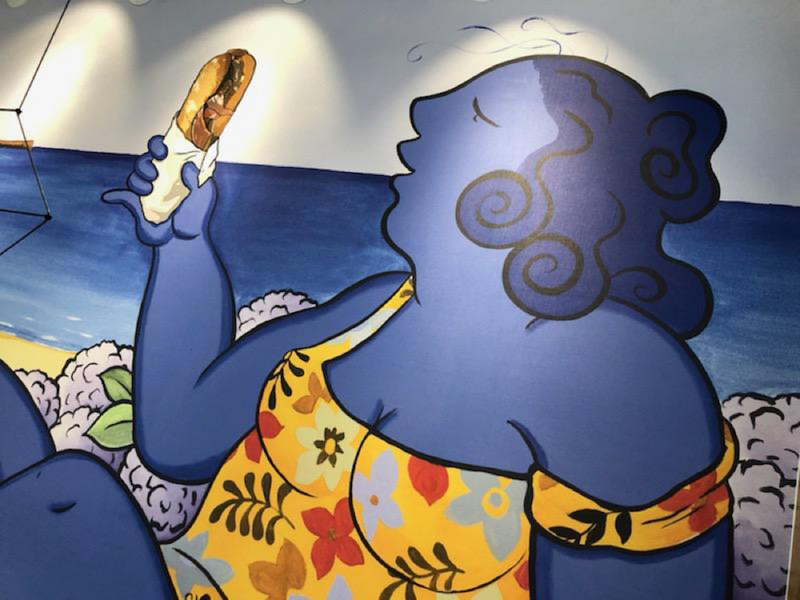 This quick-service location is the first brick and mortar version of the food truck, Pepe by José Andrés, and is located adjacent to Jaleo on the West Side of Disney Springs. 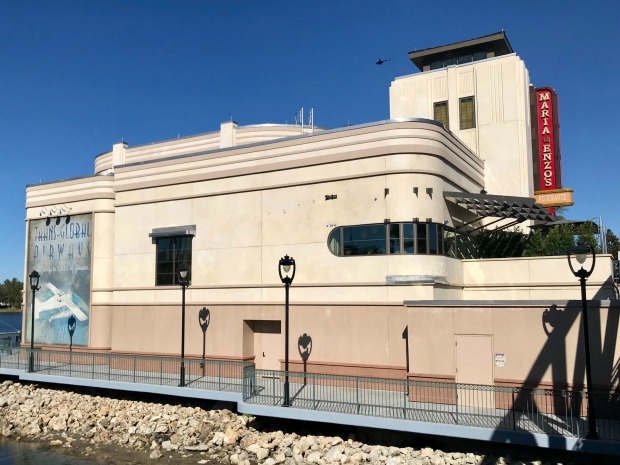 Located on The West Side of Disney Springs, Planet Hollywood Observatory features a four-story stargazing observatory as well as an outdoor terrace. Each floor provides a different ambiance, including the fabulously curated collection of film-making memorabilia and a 4,500-square-foot video wall the uses trompe l’oeil 3D technology. Classic dishes along with over-the-top burgers and sandwiches by celebrity Chef Guy Fieri are featured on the menu. Generous sweets made for sharing and hand-dipped Supernova milkshakes are also available. 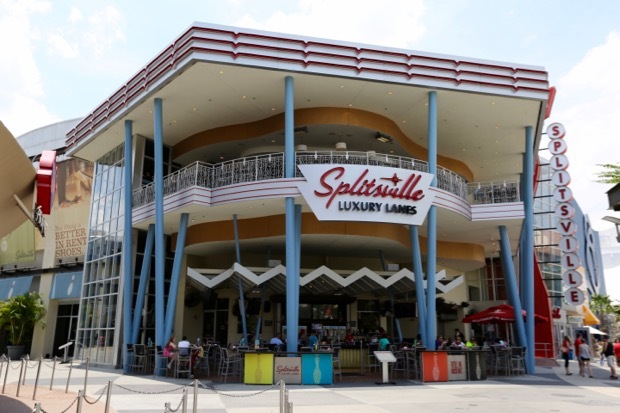 Not just your typical bowling alley, Splitsville offers full table-service dining. Get your food delivered to you whil you bowl or dine in the restaurant area. Hand-tossed pizza, fresh-rolled sushi, filet sliders and more are available. This 4,000 square ft. space is open from 10:00 a.m. - midnight. Inside seating is available, as well as a covered patio with fireplace and view of the water. Designed by architect David Daniels, the space uses reclaimed hardwood and features a living lemongrass roof and a moss mural. An interesting addition to the space is an interactive touch screen "chalkboard" that is connected to the Starbucks at Disneyland. When activated, guests will be able to see what is drawn on the board on the other coast. 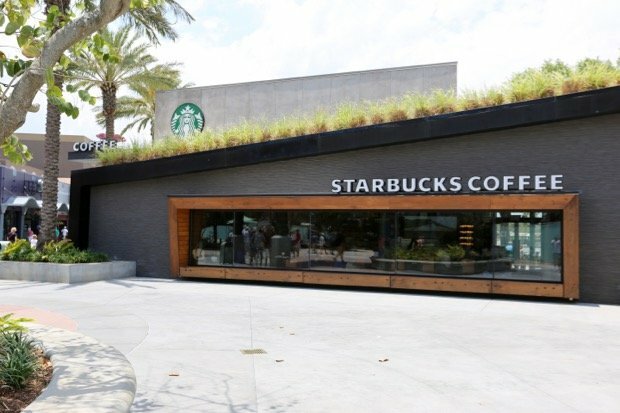 The menu features the regular Starbucks drinks, bakery items, salads, sandwiches and packaged coffee. Starbucks Reserve Coffee, designated as some of the best in the world, is available at a special counter. 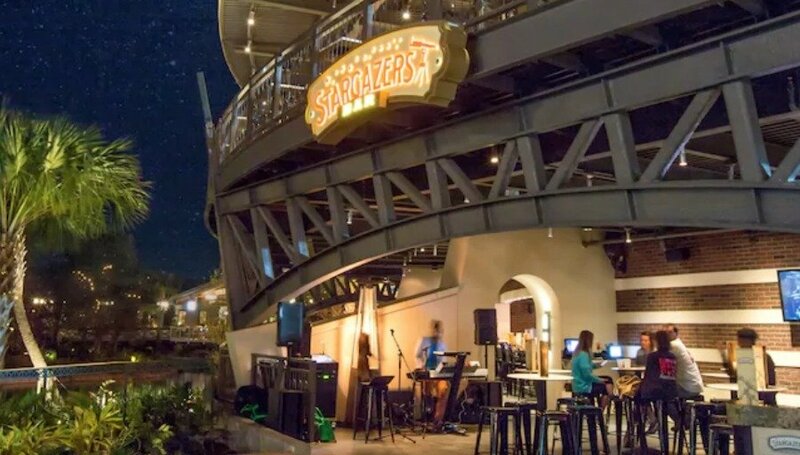 Stargazers Bar is located in the same building as Planet Hollywood and features a variety of curated cocktails and local craft beers. Guests can enjoy the outdoor patio with nightly live music. This kiosk offers sake in a variety of forms, including frozen! Food offerings range from Chinese-style pulled pork to a Sombrero with ground beef, pico de gallo, guacamole, cheese, and corn chips. Cold beer is served here also. 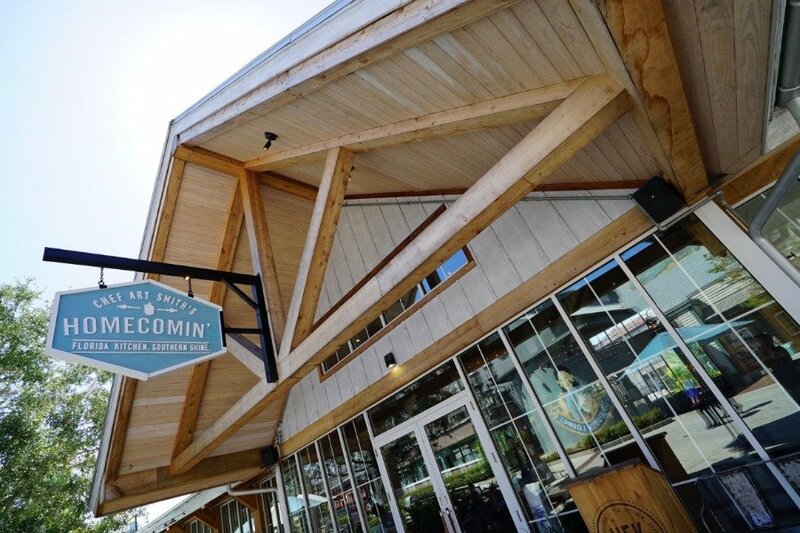 Operating hours at The Landing are Sun-Thurs 10 a.m. - 11 p.m. and Fri-Sat 10 a.m. - 11:30 p.m. 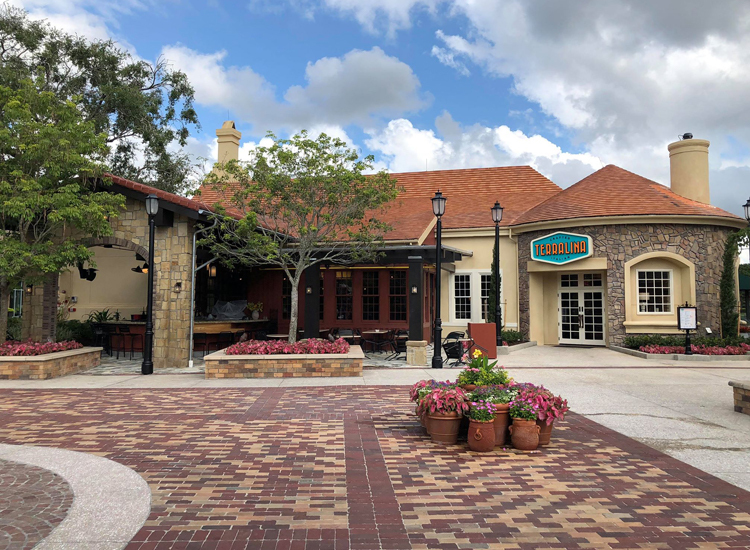 This upscale, waterfront restaurant is one of the newest restaurants to join the Disney Springs area. Featuring steaks, chops, seafood and a raw bar, The BOATHOUSE takes diners back to the 30's, 40's and 50's with their live music and floating artwork - Captain-piloted Italian water taxis and Amphicars. The restaurant can seat 600 guests - 400 inside and 200 outside - but all the dining rooms have waterfront views. There are three bars, each with a distinct nautical theme. The walls are decorated with boat motors, regatta trophies, photography, and artwork. There's even a table built into a boat in the middle of the restaurant. Guests can tour the Disney Springs waterfront on a 20-minute tour in an Amphicar; a car that drives on land and floats on water ($125 for up to 3 people, plus a Car Captain driver). Disney Springs is the only location in the world to offer rides in these vintage vehicles. The Amphicars are available from 10 a.m. - 10 p.m., weather permitting. For a more romantic option, climb aboard one of the restaurants' other water vehicles. 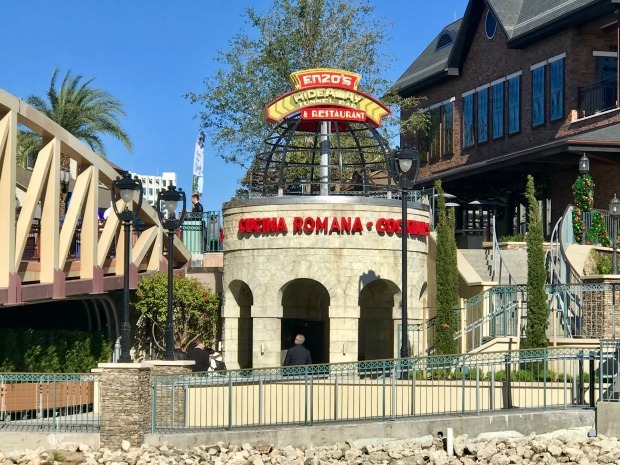 The Venezia, a 40-foot wooden Italian water taxi, offers a Captain's guided tour of Disney Springs with live music, champagne toast, and chocolate-covered strawberries. Available from 10 a.m. - 10 p.m., weather permitting. Groups up to 20. Cost is $75 per person, $50 per child under age 13. Or, try the 1800s antique steamboat Lady Rose at $150 per couple. The restaurant's boats are part of a multi-million dollar collection of rare boats, found in museums, private collectors, and international boat shows. Hours are 11 a.m. - 2 a.m. daily. For reservations, stop by the restaurant or call (407) 939-BOAT (2628). Quick service restaurant featuring classic fish and chips with Irish flair. Enzo’s Hideaway has a speak-easy vibe with a Roman appertivo cocktail bar and menu. This unique location is a great place to gather with friends and/or family while you enjoy lunch, or dinner with a cocktail. Bakery featuring gluten-free and vegan menu. Operated by the founder of Babycakes. 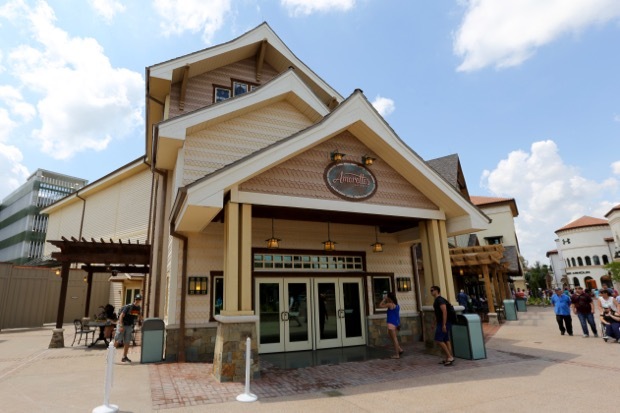 Erin McKenna's Bakery NYC delivers to many Table-Service restaurants at Walt Disney World with one-week advanced notice and offers packaged treats at many Disney Resort hotel Quick-Service venues. A wide variety of shaved ice and refreshments are available at this kiosk. 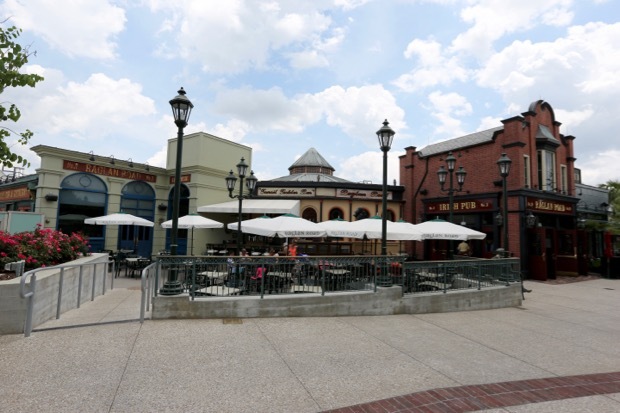 Jock Lindsey's Hangar Bar brings Indiana Jones to Disney Springs in the form of a themed bar at Disney Springs. Feel like you're back in the '40s while you're sipping on some of Jock's signature cocktails or small plates. First come, first served. 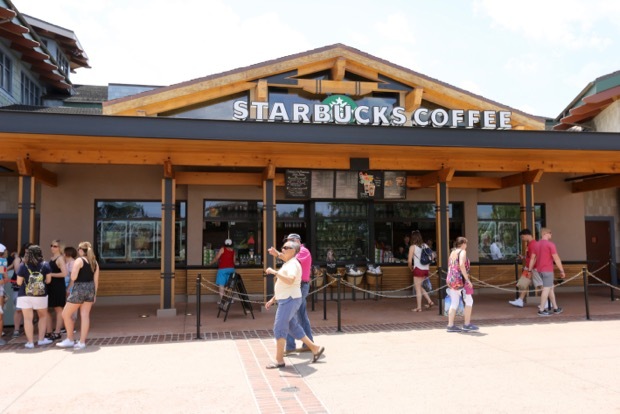 Guests can find a refreshing assortment of hot and cold beverages from the Official Specialty Coffee provider of Walt Disney World Resort. Be sure to ask a Barista to jazz up your latte with Disney character art! 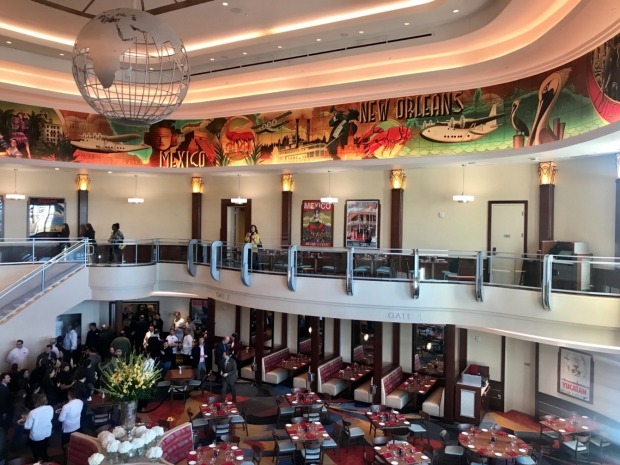 Maria & Enzo’s Ristorante is an open and airy eatery with 50-foot high ceilings, a grand staircase, and floor-to-ceiling views of Lake Buena Vista with décor that celebrates the golden age of travel. The new upscale restaurant serves up authentic southern Italian cuisine. Service is daily from 11:30 a.m - 2:00 a.m., serving lunch, dinner, and weekend brunch. 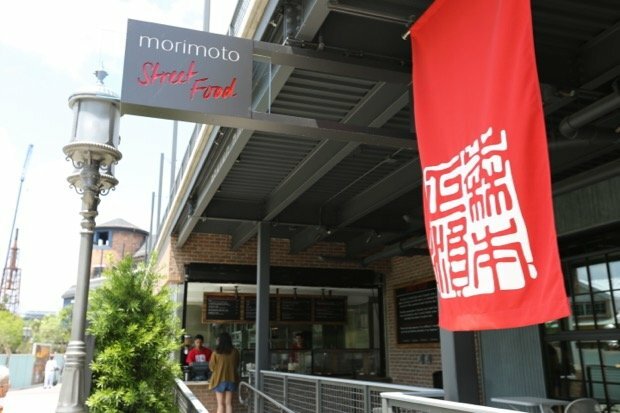 Iron Chef Masaharu Morimoto has opened his own dining experience at Disney Springs, the first pan-Asian restaurant with foods from around the continent. A three-story glass corner entryway ushers guests into the restaurant, which is made up of several dining spaces, lounges, an open show kitchen and a two-story outdoor terrace that overlooks the water. 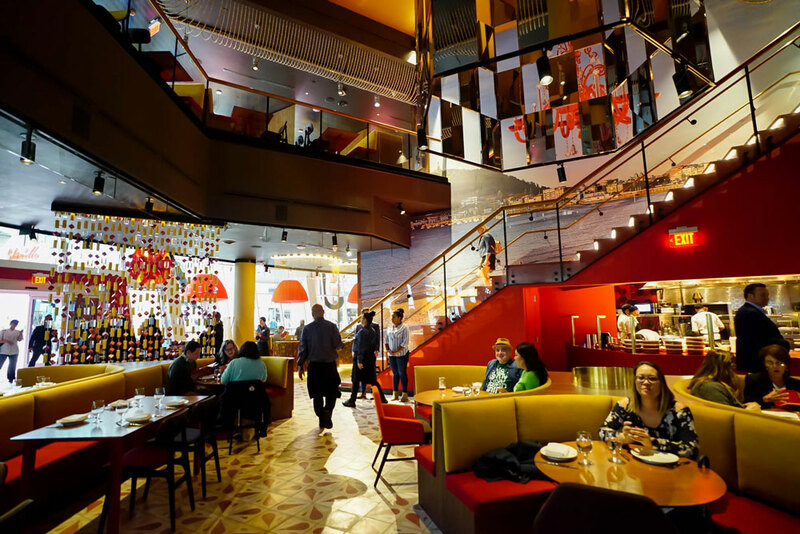 The bar is a work of art; at over 270-feet long, this connects the ground floor dining room to the upper level. Custom glass beaded chandeliers and glass mosaics complete the decor. Menu items include moo shu pork, Peking duck, lobster chow fun, sweet and sour crispy whole fish and kung pao chicken. The weekend menu includes dim sum for brunch, as well as dumplings, shumai, bao and spare ribs. More kid-friendly dishes such as chicken ramen, kakuni pork bao and karaage fried chicken are also available. For guests who want a more interactive dining experience, they may wish to sit at the 14-seat sushi bar and watch the chefs at work. The bar is sculpted from ash wood and backed with a wall of hammered copper, adding to the upscale feel of the establishment. The drink menu is extensive and features Morimoto's signature line of sake, as well as international wines, signature cocktails and non-alcoholic drinks. Asian bottled and draft beers are served, such as Morimoto's signature beer by Rogue Ales. 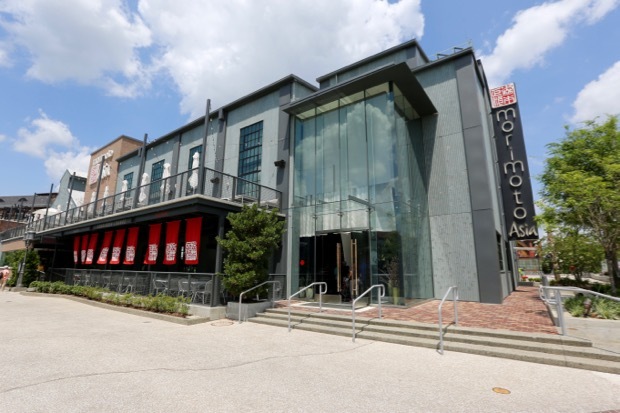 This quick service dining location is located on the lower outdoor terrace at Morimoto Asia. Menu items include sushi, donburi rice bowls, bao tacos, takoyaki (octopus, nori, okomiyaki sauce), Morimoto sticky ribs, curry rice croquettes, pork egg rolls and taiyaki (snapper-shaped pancake filled with sweet adzuki red bean paste). To drink, try popping boba tea and a variety of Asian-influenced beers and other beverages. There is a walkup window for ordering and covered outdoor seating. 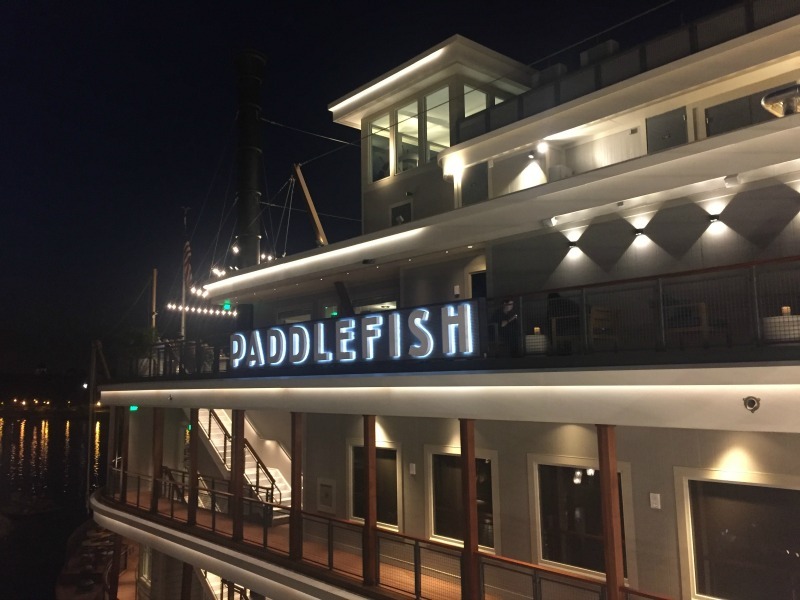 Open daily from 5-11 p.m.
Paddlefish is the restaurant that took over the Empress Lily, which was once home to Fulton's Crab House. The restaurant has newly designed interiors and a menu that is heavy on the seafood, but with options to please everyone. There is also a rooftop bar. Open daily for lunch, dinner, and late-night dining. Restaurant hours: 11:30 a.m. to 11 p.m. Advance reservations are available by calling the restaurant directly at (407) 934-2628. This restaurant does not participate in the Disney Dining Plan. 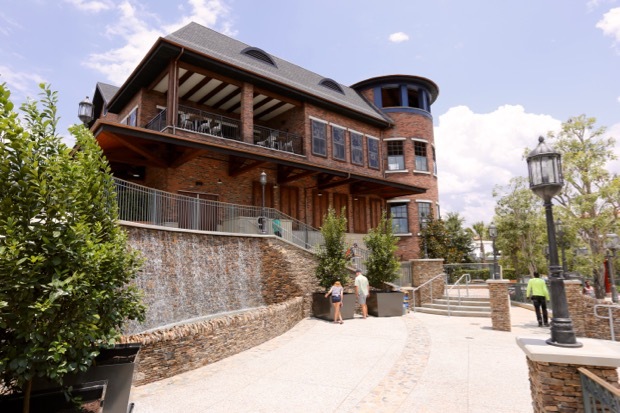 This restaurant overlooks Village Lake and features 2 stories of waterfront views. The menu features North, Central, and South American cuisine. There is also a international wine and tequila bar. Open daily for lunch, dinner, and late-night dining. Restaurant hours: Sunday-Thursday, 11:30 a.m. to 12 a.m.; Friday and Saturday, 11:30 a.m. to 1 a.m. Advance reservations are available by calling the restaurant directly at (407) 934-3700. This restaurant does not participate in the Disney Dining Plan. If you’re looking for something quick and easy, check out Pizza Ponte. Here you’ll find Sicilian Pizza by the slice, Italian sandwiches, Bomboloni, and more. This is a great quick service location if you are looking for authentic Italian food. Irish Pub & Restaurant. Raglan Road is located near the main entrance of The Landing. The ambiance and decor make for a really nice setting for dinner. If you don't like listening to a live band when you dine, then you should try to get there early before they start. This modern steakhouse and lounge is open for lunch and dinner. This 14,000-square-foot location is run by The ONE Group Hospitality, Inc. There are two stories with rooftop dining, indoor and outdoor seating on both levels, a bistro, bar, private dining room, and a fire pit. Some of the items featured on the menu include Florida grouper, chilled rubbed rack of lamb and seared tuna. Signature dishes include bite-sized "Lil BRGs" made of Wagyu beef, lobster mac & cheese, steaks, seafood and desserts. Items will be sourced from Florida-based farms whenever possible. Hours are 11:00 a.m. - 2:30 p.m. Monday-Friday for lunch, 5:00 p.m. - 11:55 p.m. daily for dinner, and 11:00 a.m. - 2:30 p.m. for brunch on Saturdays and Sundays. Reservations can be made via the My Disney Experience app, online, or by calling (407) 917-7440. The Basket is a walk-up restaurant that's attached toWine Bar George and features picnic basket-type items with finger foods and wine on tap. Serving a variety of specialty teas, both hot and cold. Bakery items aremade with various tea blends. Retail tea and related accessories also available. The new menu will include authentic Italian home cooking with items such as artisanal pizzas and fresh vegetable dishes from a wood-burning oven. Favorites from Portobello such as the antipasti platter and signature pastas can be found on the menu at this newly opened location with an exquisite waterfront view. Serving specialty gelato, paninis and espresso. This is the sister store of the original in Italy. An estate-style wine bar offering shareable small plates and more than 100 wine selections from acclaimed wineries and up-and-coming regions— handpicked by Master Sommelier George Miliotes. This high-end pastry shop offers classic cakes and pastries. Watch the pastry chefs in the open kitchen as they decorate their signature cakes. Gluten-friendly options are available as well. This fast casual artisanal pizza restaurant seats 200 guests in a new 5,000-square-foot building. This build-your-own pizza chain uses extra hot ovens to cook the 11-inch pizzas in 3 minutes. Similiar to Chipotle or Subway, guests choose which ingredients they want on their pizzas, or they can choose from some of the restaurant's suggestions. There are salads, desserts, teas, and fruit drinks available as well. The fries are freshly cut and served with a choice of dipping sauces. Milkshakes are prepared with gelato; flavors include Vanilla, Chocolate, Raspberry, Strawberry, Salted Caramel, S’mores, and Cake. The drink menu also includes root beer, cherry coke, and orange soda floats, hard sodas, draft beer, and cider. Adults have the option of adding alcohol to shakes, such as Smoked Bourbon and Beer and Godiva Raspberry. Beverages include draft beer, sangria, lemonade, and fountain soda. Open daily from 11a.m. ; closing time is between 10:00 p.m. and 1:00 a.m. 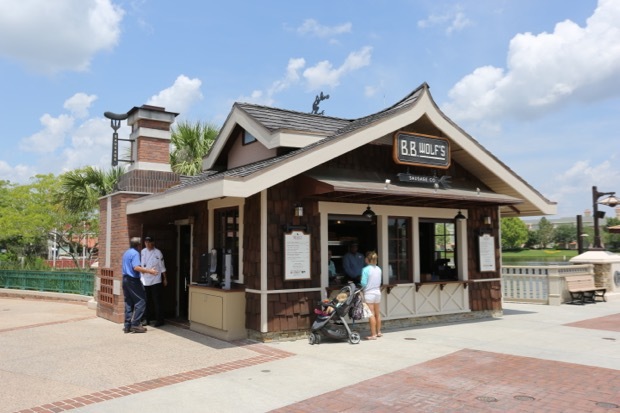 Chef Rick Bayless has opened a new restaurant venture at Disney Springs. Bayless is a six-time James Beard Foundation award winner, won Bravo’s Top Chef Masters and has hosted Mexico – One Plate at a Time on National Public Television for ten seasons. Chef Bayless focuses on Mexican cuisine and operates several popular Chicago restaurants – Frontera Grill, Topolobampo, Xoco and Frontera Fresco. The menu includes several versions of guacamole, such as Verde Guacamole (roasted poblanos, roasted tomatillo, toasted pepitas, cilantro and onion) and Atomic Guacamole (diced cucumbers, habanero salsa, cilantro, and onions). Another starter available is the Chipotle Chicken Tostada and Poached Mazatlan blue shrimp and Baja bay scallops. Entrees include Crispy Half Chicken, Shrimp Mojo de Ajo, Carnitas, Red Chile Chicken Enchiladas, Carne Asada Tacos, Chicken Taco, Pepito Torta, and Conchinita Pibil Torta. Diners can choose sides for their meal, such as Fried Plantains, Refried Black Beans with Cotija Cheese, and Queso Anejo Mashed Potatoes. Dessert choices include Pecan Pie Bar and a Coconut Lime Quattro Leches. This Grab and Go window features snack-sized versions of some of the authentic Mexican cuisine by Chef Rick Bayless, an eight-time James Beard Award winner. 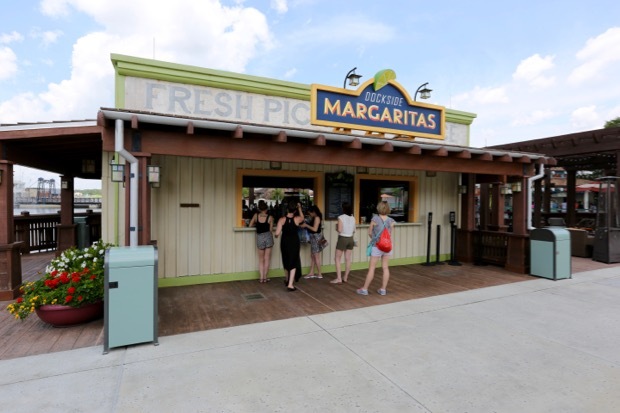 Guests can get items such as guacamole and chips, braised pork shoulder tacos, and beef barbacoa tacos to go. Restaurant hours are 11am-midnight Sunday-Thursdays and 11am-1am Fridays and Saturdays. Reservations are available at (407) WDW-DINE and online. This restaurant is from Art Smith, known from his time as Oprah's private chef and a judge on the show BBQ Pitmasters. Smith also runs Table fifty-two in Chicago, Art and Soul in D.C., Southern Art & Bourbon Bar in Atlanta and LYFE Kitchen Palo Alto. Smith has been awarded two honors from the James Beard Foundation and began his career with a culinary internship in the Walt Disney College Program. 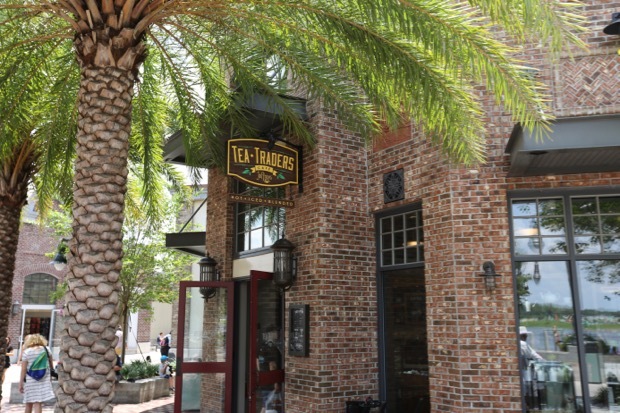 This venture is described as "where Florida heritage meets New Southern cuisine" and offers Southern favorites including: homemade pimento cheese, Church Lady deviled eggs, low country shrimp and grits, kale salad with Sweet Grass Dairy cheese and spiced pecans, a grilled Blackstrap pork chop with sawmill gravy, cakes, pies and sweets. Other menu item highlights include the Bee Haven Bay Fried Green Tomatoes and the Chopped Pork Barbecue Sandwich (line of Parker House rolls heaped with HFK sweet and spicy barbecue chopped pork and topped with Southern slaw). A signature dish is Art's Fabulous Fried Chicken, which is brined in buttermilk for 24 hours, then fried and served with "creamy mashed potatoes, cheddar drop biscuits and love." A glass-walled show kitchen allows guests to see into the action and the Southern Shine bar will offer cocktails, punches and coolers. Indoor and outdoor seating is available in the 6,000-square-foot, 200-seat restaurant; views are of the Town Center spring. 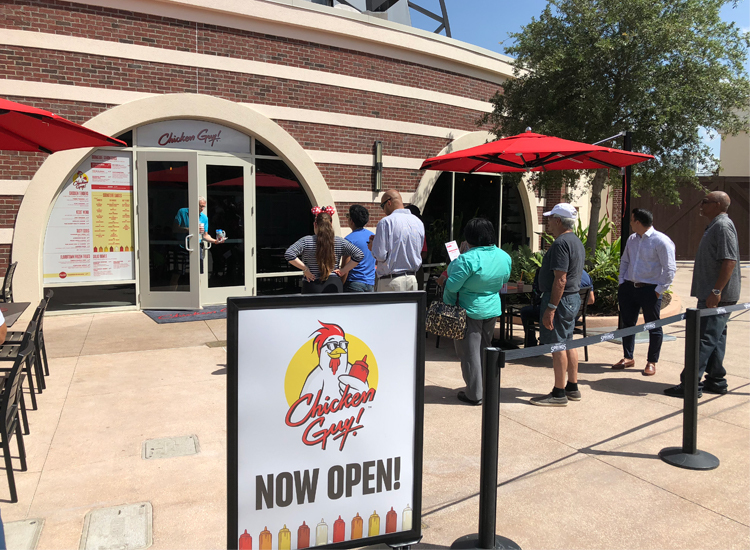 There is also a to-go window where guests can order fried chicken, chopped pork sandwiches and more. Prices range from $10-$15 for appetizers, $15-$18 for sandwiches, $16-$22 for salads, and $22-$41 for entrees. NBA Experience - coming soon! Featuring hands-on activities for families that will put you into the world of professional basketball. Will include restaurant and retail store. Sprinkles Cupcakes serves handcrafted cupcakes, homemade cookies, and slow-churned ice cream. In addition to the bakery location, Sprinkles has a "cupcake ATM" that is open from 8:00 a.m. - 2:00 a.m. The machine is stocked with about 400 cupcakes and is replenished throughout the day and again when the bakery closes for the night. A robotic arm is used to lift the boxes so the frosting stays intact. In addition to regular cupcakes, there is also vegan, gluten free, sugar free, and doggie options. Sprinkles is known for their salted oatmeal cornflake flavor, as well as banana peanut butter, maple bacon, Cuban coffee, and lemon coconut. The Polite Pig features “modern barbecue” prepared in an open kitchen, along with Southern sides such as a tomato and watermelon salad, mac and cheese, and smoked corn with lime butter. There is also a bar with seven different barbecue sauces from Layla’s Sweet to Fresno Hot Sauce. 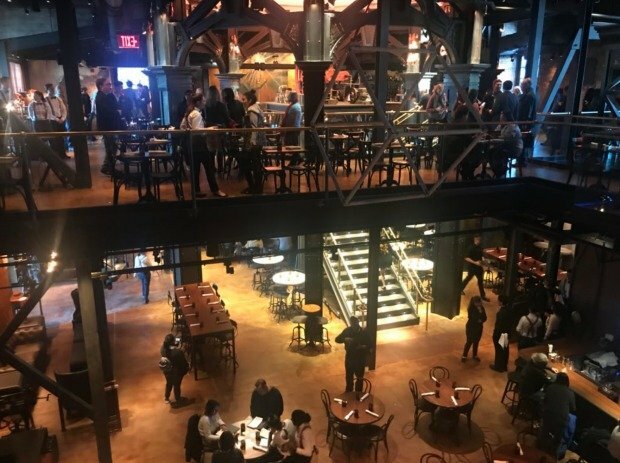 Also included on the menu is a selection of craft beers and cocktails, featuring a bourbon bar with more than 50 selections from small batch bourbons to a Pappy Van Winkle 23-Year Family Reserve.